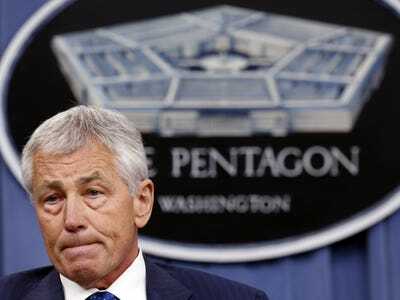 Secretary of Defence Chuck Hagel told CNN in an interview Saturday that he would consider recommendations to send ground troops to Iraq from the chairman of the joint chiefs of staff. However, Hagel insisted the troops would not be in a combat role and would only be used to help local forces find targets. “There will be no American combat troops in Iraq or Syria,” Hagel said. Hagel’s comment is the latest in a series of shifting statements from officials in President Barack Obama’s administration about what role US troops will play in the fight against the jihadist group Islamic State (also known as ISIS or ISIL) in Syria and Iraq. Obama has repeatedly insisted the growing number of American forces sent to Iraq would not have a “combat mission.” At the G20 Summit in Australia, he said Gen. Martin Dempsey, the chairman of the joint chiefs of staff, “has not advised me that I should be sending U.S. troops to fight,” However, on Thursday, Dempsey, who traveled to Iraq on Saturday to evaluate the situation on the ground, told the House Armed Services Committee he was “certainly considering” using US troops to help retake the city of Mosul from ISIS. “If we get to any other variation of recommendations from General Dempsey, we will deal with it, but we are not there yet,” said Hagel. At the G20 Summit, Obama would not completely rule out the possibility of using combat troops to fight ISIS. However, he suggested it would require a rather extreme turn of events.